In our last post, we left off with the introduction of the Showy Rib. These new ribs can be used to create dramatic scarves or, in this case, Showy Hat Brims. Here’s the perfect hat pattern to try it out. The Estrellita (little star) Hat is chock full of knitting details you’ll want to use in other hat patterns as well. These are all techniques we’ve introduced in other patterns or blog tutorials so you’ll have plenty of opportunity to practice them first. Not that Estrellita is difficult to knit, just take it step by step and the repetitive pattern becomes clear. I’ve included a list of resources for you at the end of the post. The hat starts with the Resilient Cast On. 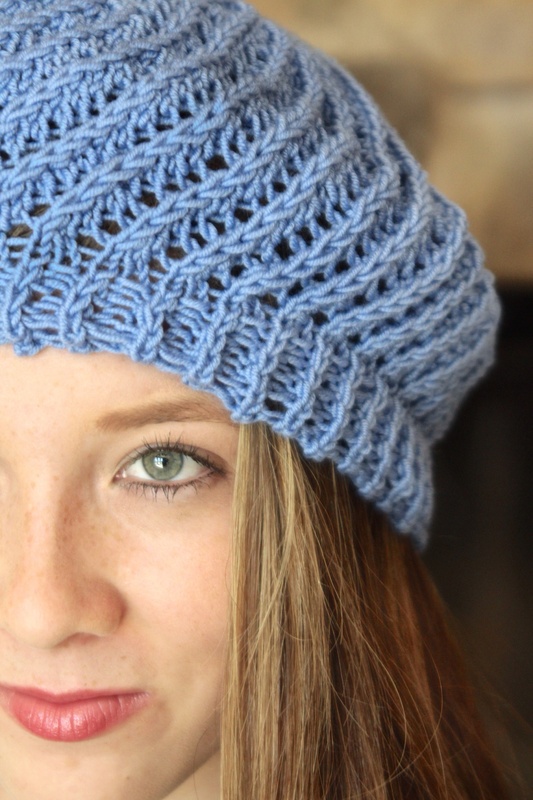 This pretty edge adds stretch to hat brims and flows right into a 1×1 Showy Rib. 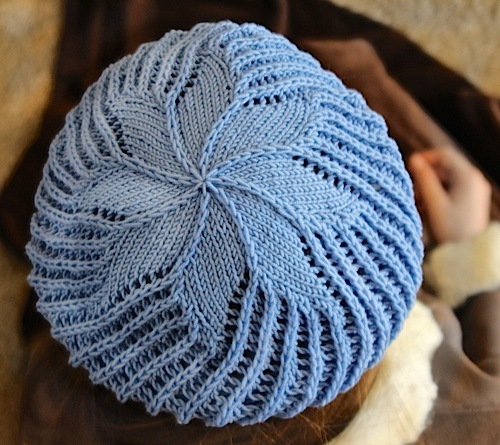 The hat body is knit in a simple lacy version of the Showy Decrease that spirals around the hat before it’s used again to shape the hat and create the star pattern (a Showy Decrease trifecta). 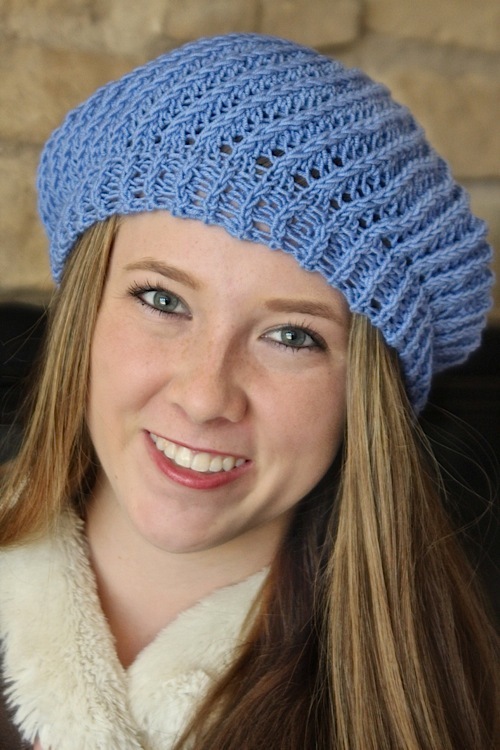 The hat can be knit as either a slouch or beret by varying the height of the body. Of course, we finish off with our patented (not really) Double Decker Hat Top that keeps the texture and finishes with a nice clean closure. Let’s take a closer look at the amazing height of this stitch pattern. 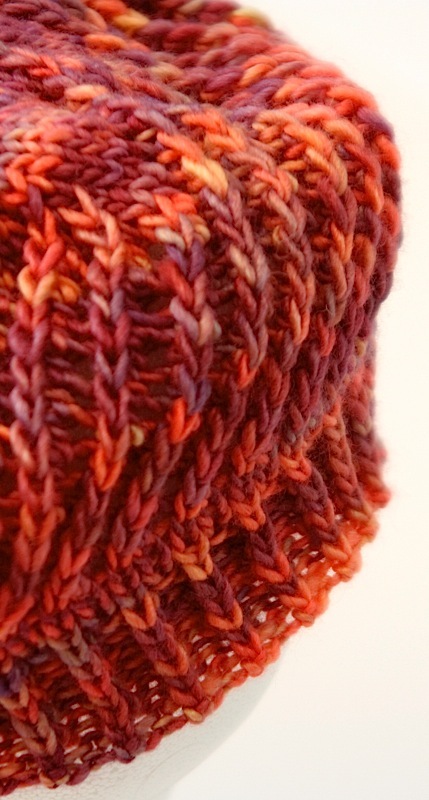 The reason we love the Showy Decrease is because of its impact on the front of stockinette. The raised ridges really stand out and highlight the spiral pattern. Since it’s much easier to photograph flat, this picture is of the matching blanket pattern. There’s more on that below. This hat knit with Mochi Plus Seafoam is also lovely. Subtle colorway variations work best. I knit another hat with a 100% merino (Lana Grossa, 22 sts per 4″), however, I was not as pleased with the results. The merino was too slippery and the hat was a bit floppy. I highly recommend a ‘stickier’ yarn like the single ply Malagrigo Silky Merino or the Mochi Plus. Some merino blends would work as well, for example, with alpaca or cashmere; Cascade Highland Duo comes to mind. A yarn gauge from 18 to 20 sts per 4″ (even 22) will work as long as you keep to the tighter gauge for the brim. A Showy Rib has a larger gauge than a standard rib so I (highly) recommend a swatch, even if it’s flat. The results should be solid, but stretchy. There’s a lot of give with the cast on and rib pattern so knitting it too tightly most likely will not be the problem. Time for an “I screwed up my knitting’ confession. If you take a closer look at this blue hat, you will notice that not only does my niece, Ellie, have beautiful eyes, but the brim looks stretched out. That’s because it is. 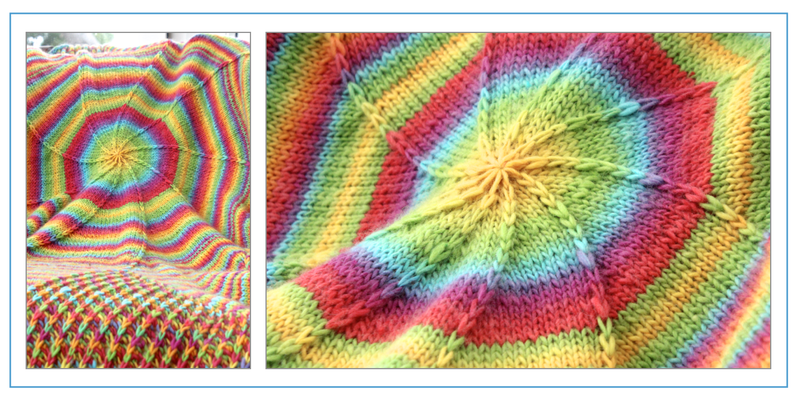 The pattern calls for a reverse yarn over to be used as the increase paired with the Showy k2tog decrease. However, in my haste to knit up another sample, I forgot. I’m (kind of) glad I did since it now shows why the reverse yarn over is important. I hope you’ll try this fun hat. It’s perfect for transitional weather and sure to become a favorite. With a quick addition of a few decreases the hat top also makes a beautiful blanket. I knit this one with a yarn with a long color change. The blanket pattern has been added to the Estrellita Hat. You can read about the Estrellita Blanket here. The last post on Showy Rib Hat Brims has swatches for you to try. Click on the Showy Decreases category to the right for all the many posts we have devoted to this fun technique. 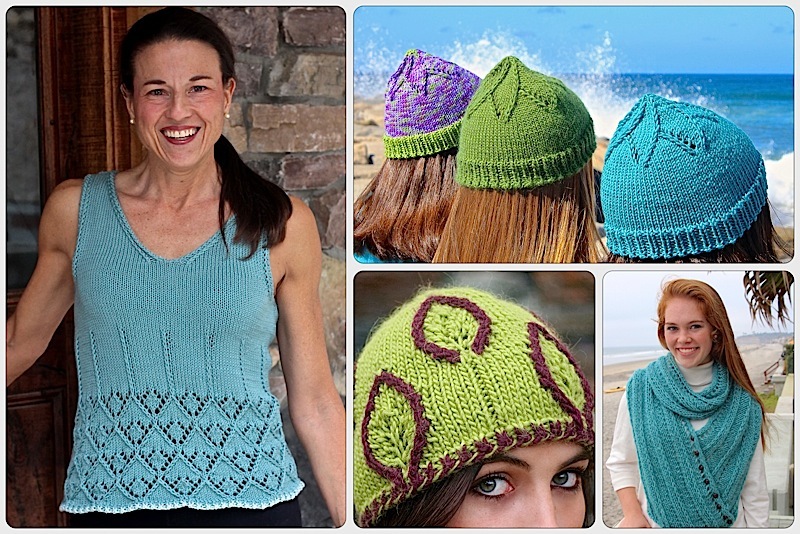 Our website has free tutorials and free patterns all listed on one easy-to-read page. Look for the Seismic and Telluride Scarf patterns and the Resilient Cast on in the techniques section at the bottom. There are also free sample pages of this pattern. You can find this pattern for $4.50 on Ravelry. Password help! There are a few readers that don’t see the password when they follow the blog. If that’s you, just click over to the “Join Us” page and read my reply in the comments section. This isn’t the first I have seen this star pattern. It is an old, old pattern. I first saw it in some doilies that my Grandmother made. Then years later, and now at least 20 years ago I saw it again in a McCalls Winter Holiday craft magazine. The same star pattern was knit into an afghan, done all in white I think, which I made for my Mother as a lap afghan. I love how if you live long enough, patterns evolve and revolve. What’s old, becomes new again. Linda, I completely agree. I love to take things that have been around and modify them with a bit more punch. The Showy Decrease makes the star pattern really stand out. Love the pattern. Just need to get it. Is it too late to get Estrella hat free on Ravelry? I tried, but looks as though it’s pay only. Hi Carol. Sure! I will actually go on and make it free now that it is has been around for a bit. I will get to that today. 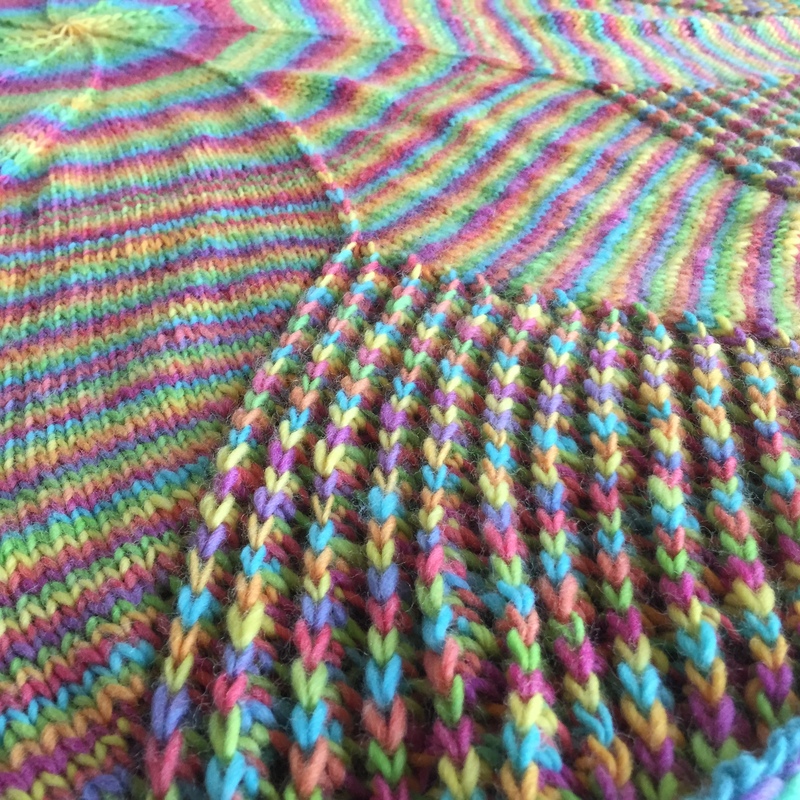 This entry was posted on September 25, 2015 by Laura Cunitz in Hats, Patterns, Showy Decrease, Showy Rib and tagged knit hat, Showy Decrease, Showy Rib.